Niaz Ahmed Khan offers a plan to deliver Greece from its recent economic turmoil in his book How to Restore the Greek Economy. Khan, who has studied in several fields, also posts a reward—“10 Million Dollar” [sic] to disprove his plan. While the gesture is a grand show of Khan’s confidence, his scheme is so massive in scale and scope that it’s unlikely any person could make an attempt at claiming the reward unless it were actually implemented. Although Khan’s plan requires the acceptance of the Greek government and its people—seemingly difficult, given all of their economic disagreements to date—there are many interesting ideas to be found in How to Restore the Greek Economy. Khan’s plan revolves around his creation MBCS (Mutual Benefit Bond System), and thus is similar to his previously published How to Reverse World Recession in Matter of Days. The driver of MBCS is the sale of bonds, offered at a discount to the public, which can then be redeemed for goods and services. Ideally, this system would draw money from black market trade into the government’s coffers, uncovering new revenue to help the government and its people prosper. There are many details to Khan’s plan, and even more predicted benefits, but they are somewhat diminished by the book’s presentation. Many words are presented with random spaces between the letters, and even the back cover bears the marks of poor editing—“supper powers” instead of “super powers,” for example. Informational charts often feature type so small, it’s difficult, if not impossible, to read. 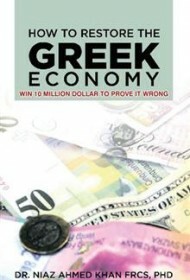 Khan’s system would dramatically remake the Greek economy; as he writes in the helpful Frequently Asked Questions section at the end of the book, “MBCS will likely crash the real estate market” and “Initially, MCCS will crash the stock market.” But Khan sees a future remade for the better, and even if viewed as a strictly hypothetical exercise, How to Restore the Greek Economy presents imaginative ideas that some readers might find compelling.